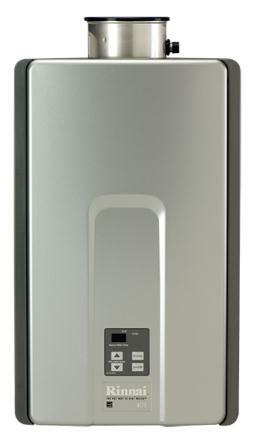 What you should know when using Rinnai water heater. How to operate the unit safely, change the temperature and use the temperature controller for monitoring? 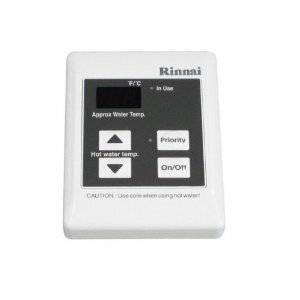 After your water heater has been professionally installed, now is the time to learn how to use Rinnai properly, for reliable, long time and safe heating. Rinnai tankless heaters are smart; they use a small computer so it can supply hot water as long as it is needed, on demand and in continuous supply, and at a preset temperature. In order to keep the temperature of the outgoing hot water constant, Rinnai adjusts the water flow since the incoming water temperature changes from summer to winter. Thanks to the modulating gas valve the heater increases or decreases its power during the heating process and based on the demand and set temperature. Tankless units are equipped with the direct electronic ignition, so no need manually to light the fire (there is no pilot light), the unit automatically lights the burner. The gas burns as long as there is demand for hot water, or when tap is opened. These units are using direct venting, which means they get the combustion air from outside and move the flue gases to the outside also. A manual gas valve located close to the water heater needs to be turned counterclockwise to the full ON position. It was assumed that the valve was in OFF. Isolation valves that are included with the water heater should be installed on both cold and hot water lines, so you can isolate the unit and do the service or maintenance, such as flushing. Open a hot water tap with the water flow higher than the minimum required (0.4 GPM) and wait some time to get hot water. How fast you will get hot water, depends on the pipe length between the water heater and the tap. It is also mandatory to have a water pressure of 50 PSI minimum (maximum is 150 PSI), while the recommended is 60-80 PSI. Most indoor water heaters from Rinnai have the temperature controller MC-91-2 integrated into the front of the unit, while it is provided with the outdoor models. Series V53 does not come with the controller. The controller allows you conveniently to check and control the temperature of hot water and if something is wrong with the unit, its diagnostic system will show the problem by using the error code. Use the ON/OFF button to turn ON the electric power to the unit. Set the thermostat to the desired setting. Indoor water heaters are equipped with the control panel which consists of the LCD display and several buttons. You can turn the unit ON or OFF, increase and decrease the temperature (in F and C). When you press the "Priority button", the green light will glow, indicating that the controller is controlling the temperature and that a water heater is ready. Rinnai water heaters work in the temperature range from 98 F to 140 F, while they come with the factory setting of approximately 120-125 F.
There is also a temperature controller MCC-91-2 that is used mainly in commercial applications, for getting higher temperatures, where the maximum temperature is 185 F. A maximum of four controllers can be installed. The most advanced Rinnai tankless water heaters are able to diagnose the problem inside the unit and display the error code on the LCD screen. Also, the controller can get you some interesting info such as the water flow rate or temperature of the outgoing water. The temperature above the 125 F can cause injuries, so special care should be taken when kids and seniors are using hot water. For example, it takes only 3 seconds of hot water exposure at 140 F for the first degree burns. A minimum flow rate is important for the heater to operate, otherwise, the unit won't run or will produce hot water with the fluctuating temperature. You can also set and change the temperature without a temperature controller. Still, the default temperature is 120 F and by adjusting the Dip switch it can be changed up to 140 F.
If during the freezing days, there is a power outage, make sure to disconnect the unit and drain all the water. As long as you water heater is getting electric power the unit will not freeze.